What if instead of the NCAA Tournament, college basketball determined its 2019 champion through bowl games? Here's how the 2019 NCAA Tournament might look if the teams were instead assigned to bowl games. Even if you don’t feel like college basketball’s NCAA Tournament is the fairest way to determine a national champion, you have to admit it’s still a whole lot fairer than how college football handles things. The College Football Playoff may have streamlined the process, but it’s still rife with valid complaints and quality teams getting snubbed. 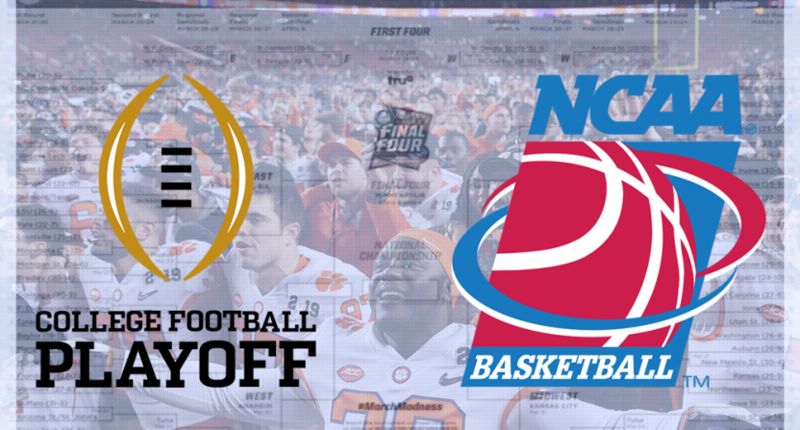 But did you ever wonder…what if we decided our college basketball postseason as we do with college football? What if, instead of a thrilling 68-team tournament playing meaningful games, we divvied everyone up into exhibition bowl games for the sake of it? What might that look like? We’ll use the 2018-2019 bowl game schedule. We’ll try to stick to the actual NCAA Tournament 1-68 seedings when possible. Same rules as football, conference champions get major bowl bids. At-large bids determined by any non-conference winning teams highly ranked and remaining at-large teams. We’ll try our best to stick to bowl-conference affiliations without getting too crazy. Mid-major bowl affiliations will be re-imagined amongst the different conferences in basketball. Keep the same order in which the 2015-2016 bowls are played. Actually, a nice mid-major showdown to kick bowl season off. Perfectly fine, if that’s your thing. Not sure which school should be more disappointed with the placement here. This is indeed a college basketball game that could happen. If Bradley loses the New Orleans Bowl, the local media will never let them forget about it. Makes perfect sense to send St. John’s to Boca where so many older St. John’s fans now live. Bummer for Vermont to be stuck with the Huskers here. But at least Nebraska will bring some fans with them. Better than the usual low-percentage NCAA Tournament game these two teams are usually stuck in. Well, at least you get to go to the Bahamas. A very sneaky fun game, in theory. To be fair, Temple is the Pitt football of college basketball. It only seems apt. A legitimately intriguing matchup that also acts as a great reason to visit Hawaii, as if you needed one. Guessing Liberty would draw well here, but also guessing Buffalo would be heavily favored. Don’t tell the Clemson football team about this one. Quite the epic fall for these proud basketball programs. Bummer for Murray State to get stuck with a low-level P5 school opponent, they deserve better. At least Baylor fans won’t have to travel far. An interesting match-up between two solid teams in a not-as-interesting locale. Don’t tell Urban Meyer about this. Also, don’t tell Rutgers about this. Quite the step backward for the defending national champs, but they can’t all be CFP seasons. Probably a better game than you’d think. Probably a worse game than you’d think. Syracuse football fans jokingly said “We Want Bama” after they beat Clemson. Here’s their perverse wish. Legitimately one of the best matchups on the list. See you in Tucson. Feels like both programs took a step in opposite directions to get here. One of the few bowl match-ups that could conceivably also be for real given their football programs. A game only Pac-12-Big Ten purists could love. A disappointing placement for the Huskies given how things looked before the Pac-12 Tournament. Way better placement than the Florida State football team could dream of right now. The Battle of the R Nickname Teams. Kinda surprised this has never been an actual Outback Bowl scenario. An “off” year for these national powerhouses, if only because they both expected to be in the Playoff. Probably the best both programs could have hoped for this season. Izzo would be pretty pissed about being left out of the CFP. Then double-pissed when he found out they’d have to play Oregon. A real bummer for Gonzaga but such is the life of a non-P5 school in the CFP. A battle of “the other really good ACC teams,” sure to be the better of the two semifinals. Congrats on your great season, Tennessee, but it’s Zion’s time now.